Be a guest at your own event! 1.Sauté shallots in olive oil until translucent. 2. Deglaze with white wine and let reduce by half. 3.Add dill and juice and zest. 5.Bring to a boil and reduce to a simmer. Let simmer for 20-30 minutes, or until thickened. 6.Season with salt and pepper to taste. 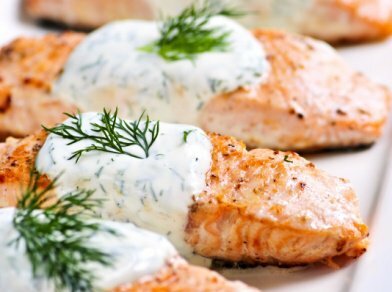 Our Chef seasons the salmon with salt & pepper and grills before drizzling with the Dill Cream Sauce.